ANN ARBOR, Mich. (AP) — John Beilein and Michigan are ready for a much-needed breather. 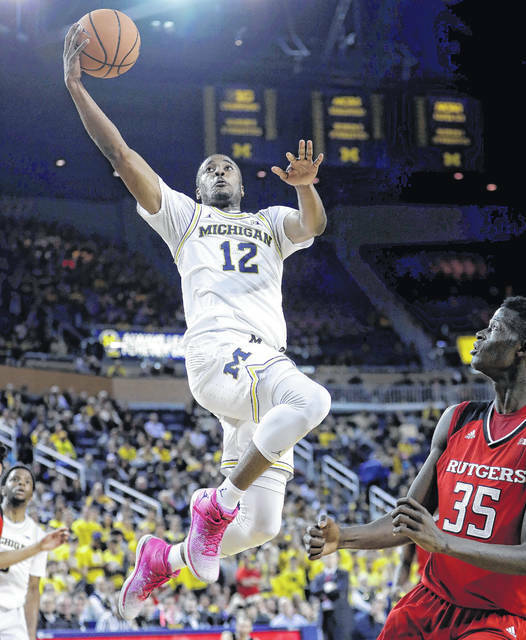 Moe Wagner scored 16 points and Duncan Robinson added 12 to lift the 23rd-ranked Wolverines to a 62-47 victory over Rutgers on Sunday. It was the fourth game in nine days for Michigan, which rebounded nicely from a 20-point loss at Nebraska on Thursday. The Wolverines (17-5, 6-3 Big Ten) took the lead for good with a 13-0 run in the first half. Michigan shot just 43 percent from the field, but the Wolverines are more capable of winning with defense than in the past, and they held Rutgers (12-9, 2-6) to only 33 percent. “If you can’t score, you can’t win,” Scarlet Knights coach Steve Pikiell said. “Certainly not on the road through this league against a ranked team (with) well-coached, good players. Corey Sanders scored 12 points for Rutgers, and Deshawn Freeman added 11 points and 11 rebounds. Freeman also had the only assist of the game for the Scarlet Knights. Robinson came in shooting only 36 percent from 3-point range on the season after finishing over 40 percent in his first two seasons with the Wolverines. He went 4 of 8 from beyond the arc Sunday, playing crucial first-half minutes after Isaiah Livers was called for two quick fouls. Lima Senior product Xavier Simpson had 10 points, eight rebounds and four assists for Michigan, and Charles Matthews added 10 points. Rutgers: The Scarlet Knights were coming off an impressive 80-64 victory over Iowa on Wednesday. Rutgers made things tough for Michigan on offense, but the Scarlet Knights have struggled this season to put the ball in the basket themselves, and this game was no different. Michigan: Robinson’s outside shooting was a welcome sight for Michigan fans on a day when the offense looked out of sorts for much of the game. The rest of the team shot only 4 of 17 from 3-point range. Michigan had a few of its most famous former players on hand. Rudy Tomjanovich spoke to the crowd while the 1967-68 team was honored, and Glen Rice came out on the court with Katelynn Flaherty during a break in the action. Flaherty, who plays for the Michigan women’s team, was honored for passing Rice’s career scoring mark. She now has more career points than any Michigan player, male or female. Jalen Rose was also at Crisler Center. He was acknowledged for his role in setting up a scholarship at Michigan. Rutgers was consistently bad offensively, shooting 8 of 26 from the field in the first half and 9 of 25 in the second. For the game, the Scarlet Knights were 2 of 9 from 3-point range. Rutgers: The Scarlet Knights host Nebraska on Wednesday night. Michigan: The Wolverines will have three days off before a big matchup Thursday night at Purdue. Michigan lost 70-69 to Purdue on Jan. 9.